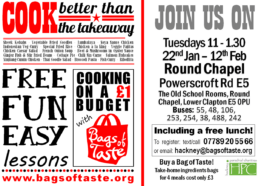 Bags of Taste courses are held at the CPURC Round Chapel Old School Rooms a couple of times a year. Bags of Taste reaches people struggling with food costs who need to feed themselves on a tight budget. Often people have no interest in changing their regular diet. Many face challenging circumstances: perhaps struggling with their health; experiencing learning difficulties; possibly in recovery or overcoming bereavement. Through the course people learn how easy and inexpensive it is to cook for themselves, almost everybody stops eating takeaways, improving their diet and often losing weight. Each course is made up of four lessons spread over four weeks, with two recipes taught in each lesson. There is a demo of the recipe, then local staff and volunteers assist and mentor their peers as they cook the meals for themselves. Also providing tips on where to buy ingredients locally, waste management, storage and skills. Afterwards everybody sits down to enjoy eating their meal together. To help people carry on practicing at home and show friends and family what they have learned participants can buy bags of the same ingredients used in the lesson for just £3 with enough to feed a group of four. Everyone is welcome! Whether you’re vegetarian, vegan or you eat halal, there will be something delicious for you.